LEX SALMOND should take a history lesson from Franklin D Roosevelt - and provide a New Deal for Scotland. Roosevelt is one of America's greatest Presidents and his grand plan in 1933 led the US out of misery. The Great Depression had been going on for four years, unemployment was at a staggering 25 per cent, two million were homeless and diseases ran riot in a weakened populace. But the New Deal put people back to work on great public projects such as building dams and bringing electricity to rural farmland. Barack Obama's 21st century New Deal has promised the same investment in schools and hospitals Stateside. 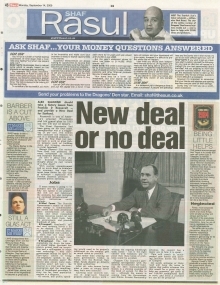 So isn't it about time that the Scottish Government thought about its own version of a New Deal? With soaring unemployment and an acute need to stimulate the economy, the time has never been better for this type of initiative - especially with Gordon Brown's promises to increase public spending. If more money is going to be pumped into the public purse, why not spend it on projects that will not just rejuvenate the economy but also revitalise our outdated infrastructure? Wind Farms: The Scottish Government's stance on renewable energy is commendable, but action has been piecemeal. Mass construction of wind farms and other renewable energy resources would cut our reliance on fossil fuels, help the environment, and provide hundreds of jobs. Transport: Scotland's rail and road network leaves a lot to be desired. The proposed high-speed line between Glasgow, Edinburgh and London is a start, but our local commuter links are in urgent need of modernisation as well. Broadband: The UK is shamefully far down the internet speed tables. Scotland has always prided itself on innovation and a willingness to adopt new technology - why can't government money be spent on fibre-optic cables to bring 100-megabyte speeds to personal and business users? We should also ensure rural communities aren't left out - the internet is a vital tool for communication and the unwillingness of broadband providers to stray too far from population centres is a disgrace. Of course, any public spending would need to be properly monitored so the country gets as much value as possible. And rather than creating yet more government bodies to watch over the Scottish New Deal, funds should go directly to local authorities. After all, who knows better what a town or county needs than their own councils? Allowing local councils control of large-scale financial projects doesn't always work - witness the ongoing Edinburgh tram fiasco - but if the right checks and balances are in place then these kinds of problems could be avoided. Glasgow City Council's partnership arrangement with the Scottish Government for funding the 2014 Commonwealth Games is a shining example of the kind of system I'd like to see - although the money is coming from the Government and Public Private Partnership schemes, the council has a major say in how it is spent. This will result in much-needed new homes and sporting facilities across the south of Glasgow. So surely someone at Holyrood will have the sense to realise that public schemes like this would be a great way to help our economy, get some of our 188,000 unemployed back to work, and build a Scotland we can all be proud of. I WAS disappointed that Glasvegas didn't win the Mercury Music Prize. Their album describes their hopes and dreams despite coming from one of the poorest parts of Glasgow. They had talent but struggled to find anyone willing to gamble on them before getting their big break by believing in themselves and making the right deals at the right times. James Allan and Co have all the ingredients to become a great band.